This weekend saw the 2018 Caroline Facer Trophy winner Jodie McKew get her hands on the trophy. The presentation took place during a break in the Development Programme training at the National Centre in Manchester. 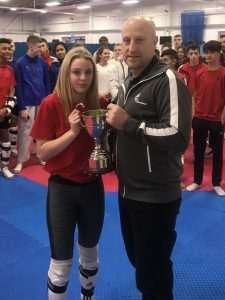 On behalf of British Taekwondo, Mr Gary Hall performance director at GB Taekwondo presented Jodie with the Caroline Facer Trophy. Jodie is in her 2nd year as a member of the GB Development Squad, and her dedication passion for the sport cannot go unnoticed. Jodie travels solo from Belfast to Manchester at least three times a month to attend all her training sessions. All of Jodie’s expenses are self-funded, and her family are continually trying to fundraise to support her dream. With her commitment and support, she has gone from strength to strength. ‘I am honoured to receive this fantastic award. I want to say a big thank you to Stuart Facer and British Taekwondo for choosing me I feel very special. Thank you to all who have supported me on my journey so far! This is an excellent way to finish off a great year’ – Jodie McKew. Thank you to GB Taekwondo for delivering this prestigious award.